*Rujeko thinks of Afrofuturism as a process rather than a label, using it as a label may be too restrictive. But its potential lies in its expansiveness and ability to push boundaries. 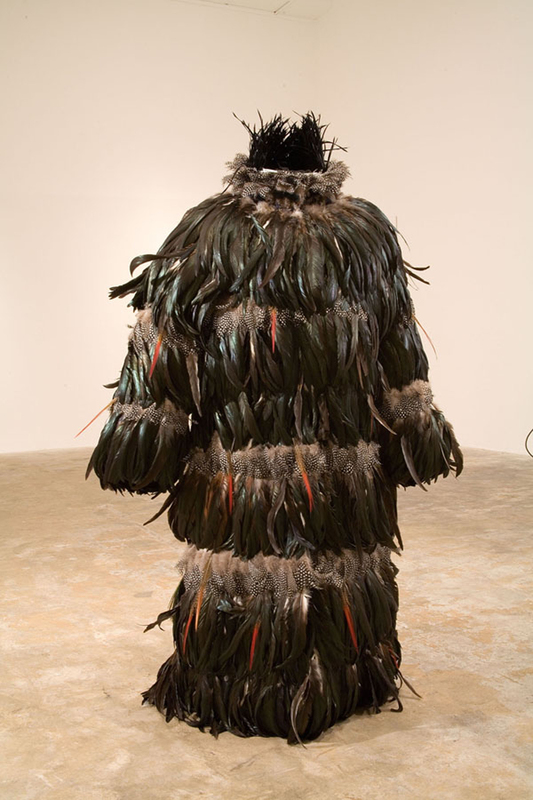 *Sanford Biggers does not want to define it and relates the term to sankofa and a Japanese word with a similar meaning. For him, history is malleable material for art that can be used for liberation and oppression. *Williams’ discussed his work The Dead MC Scrolls, which plays with legacy and the mystery of the past that is still present with us and inspiring us at the same time. Currently, he is working on Martyr Loser King, in collaboration with comic artist Ronald Wimberly, a project that will be a musical play and graphic novel about an anonymous hacker in Africa who is using E-waste, like colton, to rebuild computers and create his own village. The name is based on a foreign accented pronunciation of Martin Luther King’s name and with the cover that Williams previewed for us, a hand with its middle finger up, he expects it provoke and stir conversation. The hacker is like a virtual graffiti artist, rebelling against the industry of colton, like the its the new form of cotton. *Biggers’ thinks of his coded quilts as a form of communication and that his work is part of the historical debates about whether quilts were used as signs for the Underground Railroad. He sees it as taking this piece of Americana and reconstructing it, defacing it and experimenting with it like a graffiti artist. His adding of the qrc code to the quilt, which he claims is already “Jurassic” technology, is another way of playing with code, time and myth.How do we communicate without the advanced technology that we have? On a trip in Lalibela, Ethiopia, he came across a family who knew about all the news in another village and they were able to communicate in the middle of what seemed like nowhere without any of the technology we have here. Another one of his artworks, the ghetto bird tunic is another form of myth-making for him. The ghetto bird is a name used in California for the helicopters that circle around the ghetto, and the purpose of the tunic is for it to be part of a ritual dance where the participant wears it and dances around; if he is not seen by the “ghetto bird,” he becomes a man. Various artists have worn the tunic, including Williams, and so he sees it as a “power object,” its purpose is to see the travel of energy, to see where it lands and see its continued legacy.